An integrated handwashing station allows project teams to deliver an efficient, complete, contemporary solution without compromising on design. An unkempt, neglected, or outdated restroom makes people think a business does not go the extra mile for its customers or really care about what people think about its brand. A commercial restroom is an opportunity to separate from the standard, not just the subpar. 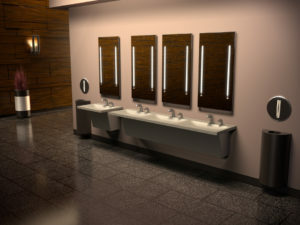 Building professionals can adopt these design tips to ensure a pleasant customer journey all the way inside a business’s restroom, starting with the handwashing station. A common disconnect in commercial restrooms begins with the handwashing station. Many manufacturers do not bring their solutions full circle between hardware, basins, and other accessories. A manufacturer with a solid surface integrated handwashing system (matching up the lavatory, faucet, and soap dispenser) can deliver an efficient, complete, contemporary solution without compromising design. Although they may be offered as complete systems, there are still many choices in faucets, basin designs, colours, and surface materials to give visual flexibility. 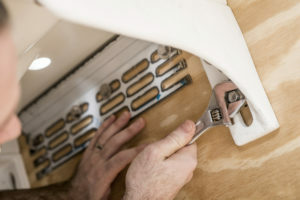 Additionally, some product providers overlook design support as a complimentary service to plumbing professionals, architects, and business owners. However, this is not a universal truth. Building professionals can find manufacturers who treat the process more like a partnership and offer a complete portfolio, along with options, online technologies, and expert design assistance. Integrated handwashing systems provide an all-in-one approach to restroom design. The result looks cohesive, and the final solution works better together. Some handwashing systems offer a solution where products are engineered to work together for higher performance and ease of installation. For example, a behind-the-wall carrier is seamlessly matched to function with the basin and withstand misuse and abuse. Behind-the-wall carriers are suitable for high-traffic areas where frequent use or vandalism is a concern. Behind-the-wall carriers are securely mounted to the concrete floor, providing strength and durability to the entire handwashing system. This mounting option stands up in high-traffic areas, like schools, stadiums, and hospitals, where frequent use or vandalism is a concern. They also optimize space. An upright carrier system installation means developers do not have to build out a large cavity. It also allows one to gain floor equity, which helps with code compliance. For example, 75 mm (3 in.) save billable square footage on the other side of the wall. A carrier variable by height and width after installation saves the contractor time if adjustments need to be made. Depending on the scale of the restroom and station configuration, one will want to make sure the carrier meets the highest load rating. The American Society of Mechanical Engineers (ASME) A112.6.1M-1997, Floor Affixed Supports for Off-the-Floor Plumbing Fixtures for Public Use, allows 136 kg (300 lb) per basin with a maximum deflection of 3 mm (1/8 in.) at the wall and 9.5 mm (3/8 in.) at the basin rim. Therefore, a triple basin would support up to 408 kg (900 lb) on the front of the wall. The mounting and wall brackets and necessary hardware should come organized together in one shipment. A diligent manufacturer will also include step-by-step directions with pictures and discernible language. A mounting bracket may need to be used when a behind-the-wall carrier system is not an option. basins must exceed the requirements in regards to warpage and surface flatness (1.5 mm [59 mils]/ft back edge, 2.2 mm [87 mils]/ft all other surfaces). When selecting a handwashing system, it is best to avoid porous materials. Water collects grime and bacteria, especially in cracks, crevices, and porous surfaces. A nonporous solid surface offers the highest level of sanitary conditions. For example, an acrylic resin poured into a solid surface moulding not only improves esthetics with modern structure and colours, but also delivers the cleanliness standards imperative to a high-traffic commercial restroom. If design professionals want a marble or granite appearance, look for a manufacturer that can offer those options sans porosity. It will last longer and be easier to maintain. To achieve the high-end appearance of stone, designers must check with the provider about alternatives. This way, collection of bacteria can be avoided. Regardless of the material, all basins that fall under CSA B45.5-17/IAMPMO Z124-2017 guidelines must meet or exceed colourfastness, stain resistance, wear, cleanability, cigarette burn, chemical resistance, thermal shock resistance, and overflow testing. Faucets and soap dispensers should always be an integrated pairing, whether using sensor or timeout technologies. The little details make up the big picture when it comes to a handwashing station. Finish options are a must, whether it is brass, nickel, or stainless steel. No matter the number of stations, the selected fixtures should install seamlessly and complete the space, visually and operationally. It is fair to check the level of testing a manufacturer goes through to ensure performance within the system. Timing, like space, matters. A few seconds off and it can disrupt the flow of the user experience. Low flow rates reduce a building’s footprint and conserve water. Switching to a 0.5 gpm flow saves thousands of gallons each year, lowers monthly bills, and works toward earning water efficiency points for Leadership in Energy and Environmental Design (LEED) certification. Proper spacing should also be considered. Users prefer personal space without worrying about splashing or bumping into the person next to them. Around 559 mm (22 in.) depth for the basin prevents splashback on users’ clothes and arms and results in less water on the floor, which eliminates safety hazard. Patrons appreciate a countertop that is roomy and a flat space for their personal items such as phones, keys, handbags, and coffee cups. A customer’s experience should be just that—an experience from the moment he or she walks in the door. Whether it is a retrofit project or new space, partnering with the right provider will help design professionals make choices with confidence. Compliance, sanitation, environmental responsibility, and personal space all play into the restroom journey, as much as esthetics and style. 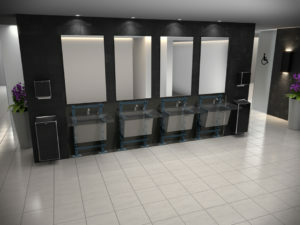 Let the restroom design set the tone for the project and the standard for a client’s business. 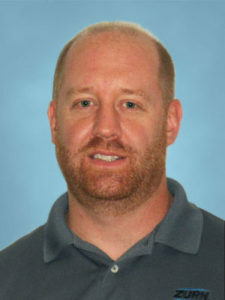 Dan Danowski is the product manager–finished plumbing group with Zurn Industries. Danowski has more than 20 years of experience in the commercial plumbing, engineering, manufacturing, and marketing innovative products. He can be reached at dan.danowski@zurn.com.